Irish Cement has said the practice is safe and there will be no added emissions at the factory. 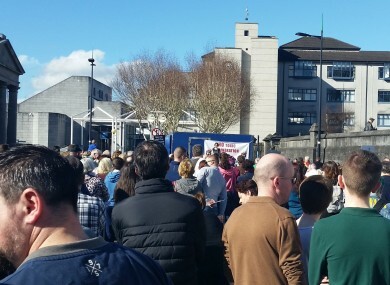 OVER 1,000 PEOPLE turned out in Limerick city today to protest against a cement company’s plans to incinerate tyres at 1,500 degrees. The Irish Cement factory in Mungret had been burning fossil fuels but they are expected to start burning tyres and other industrial waste in the near future. Residents in the local area fear that harmful emissions from the burning tyres can cause a host of health problems. Limerick city council granted the company permission to burn the materials at a meeting on Thursday. Limerick Against Pollution (LAP) released a statement and said they are protesting the developments because they are worried for the health of the region. A spokeswoman said: “ The community-led action is being organised to raise awareness among the citizenry of the mid-western region of the potential dangers and health risks associated with this planning decision. The hasty nature of the verdict was clearly intended to unsettle any fair and transparent public consultation process. Email “Over 1,000 people protest against Limerick incinerator plans”. Feedback on “Over 1,000 people protest against Limerick incinerator plans”.